Morris Panych is one of Canada’s great playwrights and Vigil is, in my opinion, his most masterful work. It’s dark, twisted, morbid, funny as hell, and so incredibly charming. With such a wonderful script it really is hard to go wrong and A Missing Link Theatre Company’s production at The Grand’s McManus Studio is a worthy rendition and definitely worth a watch. 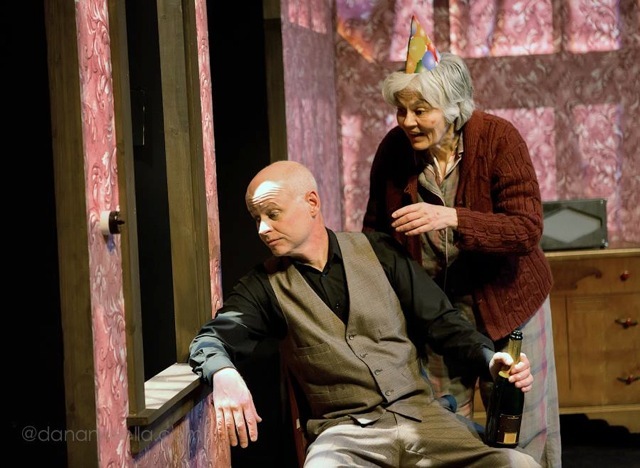 The story of a rather disturbed, eccentric Kemp, played by Colin Legge, and his estranged aunt Grace, played by Carol Robinson-Todd, is set cleverly in an abstract-esque attic bedroom. 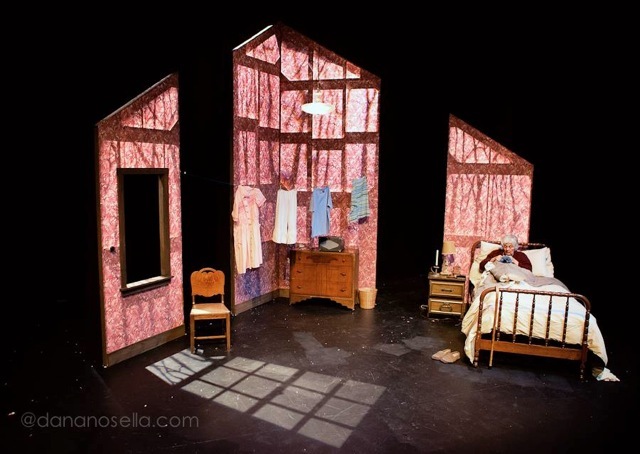 The set, designed by Eric Bunnell, is inspired. Its height compliments the themes of the insignificance of life as it dwarfs the actors and the semi-translucent walls which, when lit from behind change in colour and reveal a forest pattern, work brilliantly with Stephen Mitchell’s lighting design. It is somehow distinctly Canadian. The use of falling snow and leaves as the seasons change, a large thematic point of the play, were, I thought, unnecessary as the beautiful lighting design accomplished far more in setting the tone of the changing weather. All in all, the design and vision for this production are enchanting and we are easily transported into Panych’s world. Legge has his work cut out for him with this mammoth role. Kemp, who speaks all except about four lines in the play, is strange, perhaps mean, but yet sympathetic and somehow charming. Legge does a more than fair job of hitting all these notes. His portrayal is focused and endearing but the audience was, at times, left wanting to like him more. It felt like Legge was sometimes detached from the scene. The play is largely a collection of Kemp’s monologues, which Legge delivered, for the most part, out to the audience instead of to Grace, who listens intently. Their relationship could have had much more depth had they connected more consistently. However, Legge makes up for these small missteps with a lighting fast comedic timing; he has us howling even when we know we shouldn’t be. His choices are bold, interesting, and his use of silence, particularly in the play’s final scenes, is heartbreaking. Carol Robinson-Todd as Grace is an absolute delight. Her range of emotions, despite her lack of dialogue is a true testament to the brilliance of this actor. It’s difficult to take your eyes off her. She is adorable, witty, curious, and above all, intriguing. This production is worth seeing for her performance alone. She is a brilliant storyteller, using her every belabored movement, dart of the eye, or subtle gesture to seduce us and share her life with us. When she does speak, for the first time after about fifty minutes, her voice is seemingly familiar, as if she’s our own grandmother. A joy to watch. With a strong cast and a brilliant script at his disposal Rick Kish has struck gold and his masterful direction ties this wonderful production together. It is a clean, simple show, with an intelligent vision, that, rightly focuses our attention on the ingenuity of Panych’s script and the expert performances by Legge and Robinson-Todd. This is one of those rare ‘must watch’ productions. Go and see it. Ryan Cole is an actor, director and producer from Aurora, Ontario and is completing his degree in Philosophy from Western University. He was a founding member of the award winning company Richmond and Tower Productions and is currently the Artistic Director of The Arts Project’s Young Company in Residence: Tempting Tree Theatre Collective. Ryan is excited to be directing a professional production of Neil LaBute’s Reasons to be Pretty in February 2014. *a correction has been made to the dates and times listed for this performance. This entry was posted on November 15, 2013 by ahscreviews.